36 GPD 4-Stage undersink reverse osmosis filter system. Optimized for city water. 36 GPD 5-Stage undersink reverse osmosis filter system. Cleans the dirtiest water. 36 GPD 4-Stage undersink reverse osmosis filter system with booster pump. Provides needed water pressure. 36 GPD 5-Stage undersink reverse osmosis filter system with booster pump. For high sediment and low water pressure. 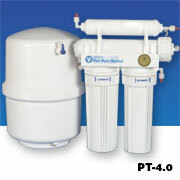 50 GPD 4-Stage undersink reverse osmosis filter system. High volume system optimized for city water. 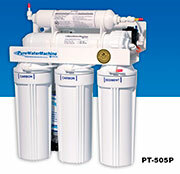 50 GPD 5-Stage undersink reverse osmosis filter system. High volume system blocks excess sediment. 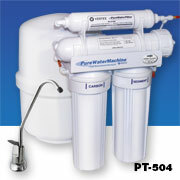 50 GPD 4-Stage undersink reverse osmosis filter system with booster pump. Pump provides needed water pressure. 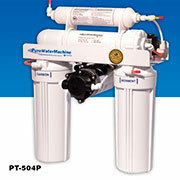 50 GPD 5-Stage undersink reverse osmosis filter system with booster pump. High volume system blocks excess sediment in low pressure applications.